contains a selection of paintings which are available as Giclee Reproduction Prints. Giclee (gee-clay) is a artistic professional technique used in the reproduction of artwork. It is a french word meaning "to spray with ink". PRINT MEDIA - PAPER - 320gsm Elite Rough Textured Cotton Rag paper . COMPLETE PRINT ORDER FORM or CONTACT ME with details. Each Print is signed; Editions are numbered. 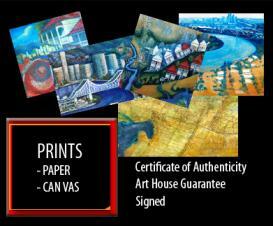 A Quality lifetime guarantee by ARTHOUSE REPRODUCTIONS . NOT INCLUDED : Framing is not included but Canvas prints can be stretched onto bars so it is ready for hanging.